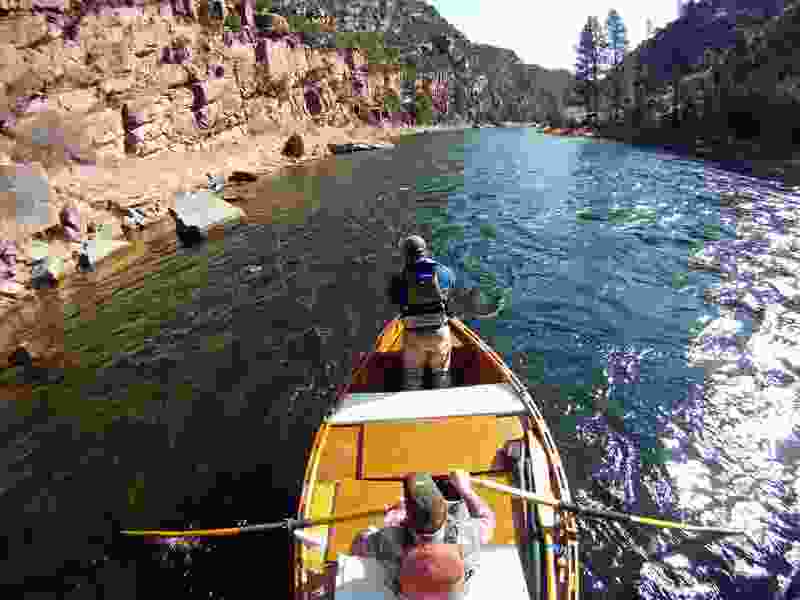 (Francisco Kjolseth | Tribune file photo) Richard Hemingway strips his line while good friend Jeremy Christensen mans the oars of his personally hand made dory while floating the A section of the Green River in late March. The river, which meanders about 730 miles from its headwaters in the Wind River Range in Wyoming through Utah, Colorado and back into Utah, is No. 2 on the list of America's Most Endangered Rivers of 2012, according to a new report by American Rivers. The report cites proposed pipelines and a nuclear power plant that would remove huge portions of water as major threats to the river. It is one of Utah’s smallest towns, located in a remote corner of the state, but Dutch John has a big beef that it’s now taken to federal court. The town of some 150 or so people, mostly fishing guides, federal workers on the nearby Flaming Gorge dam or state biologists, filed suit this week against Daggett County on allegations that county officials have been spending money intended for the benefit of the residents. Dutch John leaders claim the county has sold off about $4 million in buildings and real estate in the town that was built by the federal government in the 1950s to house construction workers on the nearby Flaming Gorge Dam. Instead of spending $3.4 million on local services as required by the federal law that relinquished federal ownership of Dutch John in 1998, the suit says, the county has used it for other purposes. It also failed to turn over the rest of the proceeds — $600,000 — to the feds, the town alleges. The suit also raises the prospect that the county, which is in dire financial straits after taking a major hit last year from the closure of its money-making jail, is poised to begin a fire sale on the remaining town properties. “The county has told the town that it might engage in a ‘liquidation sale’ of the ... property, obtaining far less than fair market value,” the lawsuit states. Also at issue is some $300,000 annually from the feds to the county to pay for town services that the suit claims may have been used in other ways. The town asks the court to require that the county obtain a fair price for any property sold, that it use 85 percent of that money for town services and send the remaining 15 percent to the U.S. Treasury. It also seeks a detailed accounting of the transactions and the county’s outlays. Calls to Dutch John Mayor William “Bud” Rogers, Town Clerk Harriet Dickerson and Daggett County Commissioner Jack Lytle were not immediately returned. The Tribune also left messages for attorneys for both the county and the town. Daggett County has struggled financially since a prisoner-abuse scandal last year shut down its jail, which had been a major revenue producer because of dozens of state inmates being housed there. Some 80 state inmates were pulled from the jail after discovery of the torture of inmates by stun gun and K-9s and the approximately $1.5 million in annual revenue from the state was cut off. The state funds made up a sizable chunk of the county’s budget and local leaders and some state officials have been trying to come up with alternative revenue streams ever since. Additionally, three of the former inmates have pending lawsuits against the county and state for the abuse — in which several former jailers and the ex-sheriff pleaded guilty — and are seeking damages.